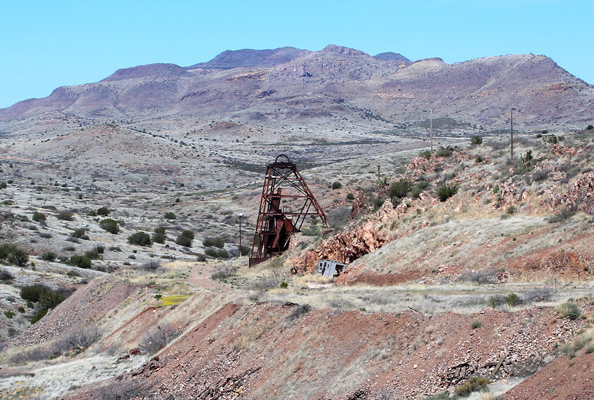 Discovered around 1900 in the volcanic hills of western Greenlee County, this mine was intermittently active all the way through to the 1980's. Over its lifetime, several hundred thousand tons of ore were shipped. 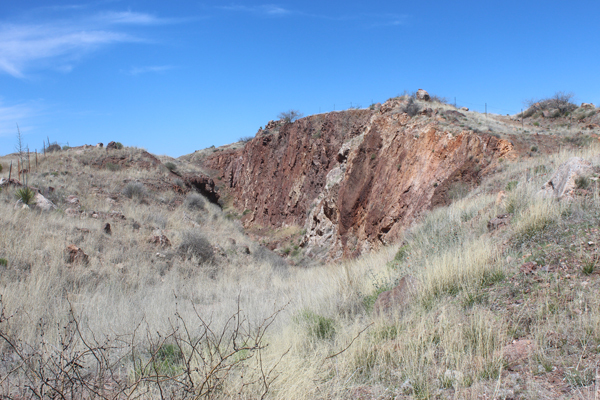 Initially, there were good silver values, and it was profitable to operate the mine for its precious metals content. The high grade silver did not last. 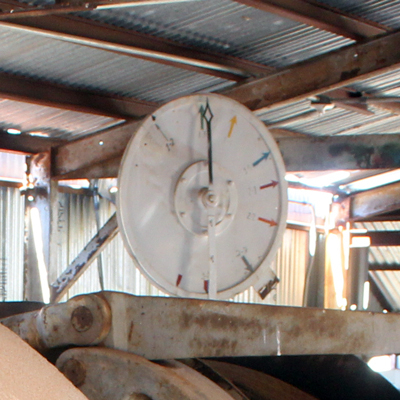 The life of the mine was extended by the huge amount of quartz that was present in the veins alongside the silver. The quartz was able to be sold as a silica fluxing agent needed in the smelting of copper. There happened to be four of those smelters nearby. 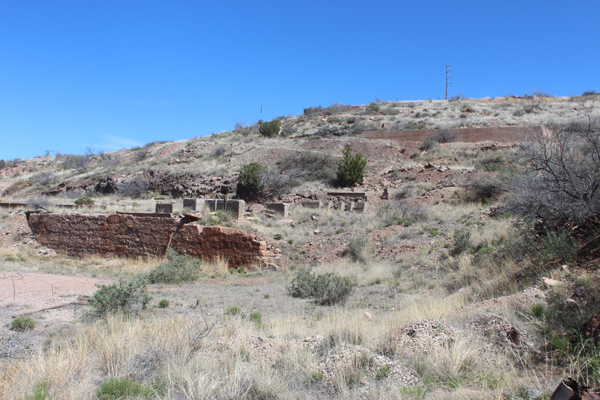 At different times, the smelters at Morenci, Douglas, Playas New Mexico, and Miami each received materials from this mine. The silver, gold, and copper were recovered as secondary products. There are several shafts on the property. This is the only one still having its headframe. 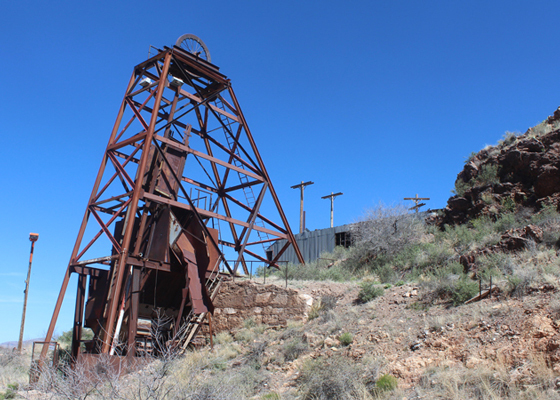 One mine report notes that a wooden headframe and an ore bin were destroyed in a fire in the 1970's. This map section shows an extensive set of underground workings. 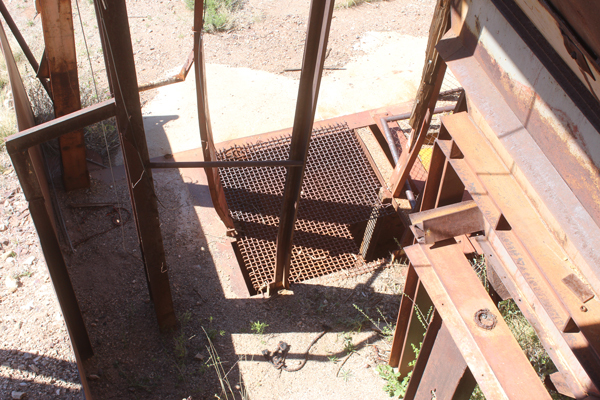 The hoisting machinery was housed in a sheet metal building near the headframe. The double drum hoist was electrically powered. Through the years, the mine was operated by at least 6 different companies. 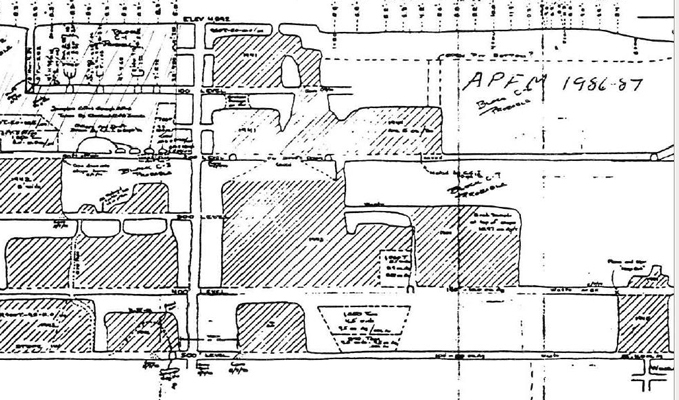 In the 1980's, Phelps Dodge constructed 3 declined adits from the surface that were sloped downward to intersect the old mine works. The adits were large enough that rubber tired vehicles could be used to haul the ore out of the mine. 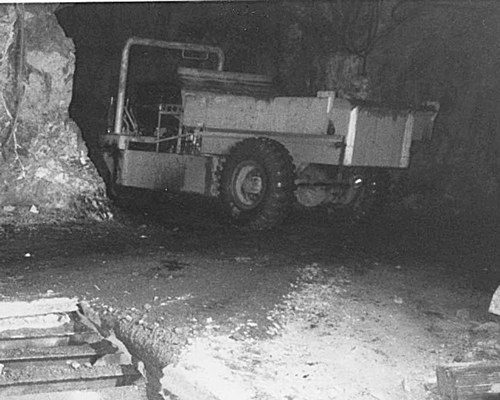 This photo from the Arizona Geological Survey shows one of the underground trucks used to remove the ore. In the 1960's when Inspiration Copper Co. was the operator, open cuts were used to work the tops of the underground veins. Some of the concrete foundations may date back to the 1930's when a mill was erected to concentrate the ore before shipment. The milling process was so inefficient that the mill tailings were later scooped up and sold for their silver and silica content. This sign was on the unlocked gate across the road leading to the mine site. There were no signs near the equipment or other workings for visitors not to be there.